CLOPPENBURG, Germany (BRAIN) — Pon Holding on Tuesday said it would pay the last shareholders of Derby Cycle 31.56 euros per share to buy out the remaining 5 percent interest in the company. AUSTIN, TX (BRAIN) — Tern, which provided share bikes at the South by Southwest Interactive conference in Austin last spring, will do the same at a related event this month, the SXSW Eco conference. WASHINGTON, D.C. (BRAIN) Monday June 18 2012 3:00 PM PST—The results of a new study detailing the usage of Capital Bikeshare, the 1,500-bike rental scheme in Washington, D.C. and Arlington County, Virginia, were released today. MONTREAL (BRAIN) Thursday May 24 2012 10:40 AM MT—Dorel Industries’ chief executive Martin Schwartz told company shareholders Thursday morning that he expect Dorel’s fast growing bike business to keep moving ahead at the same pace this year. ALMERE, Netherlands (BRAIN)—Pon Holdings now controls 92 percent of Derby Cycle Werke with the recent close of a second acceptance period of the Dutch company’s voluntary takeover offer. MAINZ, Germany (BRAIN)—The city of Mainz, Germany introduced a 4 million euro plan to integrate bicycles into the city’s public transportation system this week. LONDON (BRAIN)—Brompton Bicycle has spun off a new company to manage a new bike share scheme in the U.K.
SAN FRANCISCO, CA (BRAIN)—Timbuk2’s retail store in the Hayes Valley neighborhood of San Francisco is making a small fleet of four Globe bikes available to shoppers for free as part of a new bike share program that launched today. 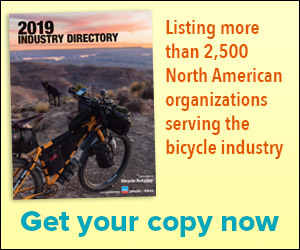 SAN JUAN CAPISTRANO, CA (BRAIN)—The Outdoor Retailer Summer Market trade show will feature a Bikeshare Program, presented by Swobo. WASHINGTON, D.C.—Move over Paris, you have some American competition. Well, not quite. But a much scaled-down version of its highly successful Vélib bike rental system should be hitting the nation’s capital this month after a few months delay. SAN DIEGO, CA (BRAIN)—The success of bike share programs like Velib in Paris has some U.S. companies devising ways to create similar programs stateside.